The administration released an implausibly small number of emails related to the reissuance of tens of thousands of parking placards in the run-up to last year's election. An email from de Blasio to his aides and DOE officials after the press caught wind of the mayor’s teacher placard deal, blacked out by City Hall. What led Mayor de Blasio to reissue tens of thousands of parking permits to Department of Education employees? City Hall isn’t telling us the whole story. Seven months after Streetsblog filed a freedom of information request for emails and other records pertaining to last spring’s rollback of Bloomberg-era parking placard reforms at the DOE, City Hall responded with a handful of heavily redacted emails from and to de Blasio and other top officials. A little background: In 2008 Mayor Michael Bloomberg cut the number of DOE placards from 63,000 to around 11,000 to align the number of permits with the number on-street parking spots reserved for school staff. Until then, DOE handed out placards to teachers and other employees regardless of the numbers of reserved spots, leading to endemic illegal parking around schools. Sidewalks, crosswalks, bus stops, no-standing zones, and other areas where parking is normally prohibited were fair game, since a placard is in practice a license to park basically anywhere with no fear of getting a ticket. The Bloomberg reforms aimed to reduce that traffic and parking dysfunction. After some resistance, the United Federation of Teachers accepted the cuts — Randi Weingarten, UFT president at the time, said the old system caused “huge frustration.” But the Council of School Supervisors and Administrators, the school principals union, sued the city to get placards for its members restored. Last spring, an arbitration ruling led the city to reissue CSA placards. But according to the CSA, City Hall’s hand wasn’t forced. The de Blasio administration “decided on its own” — in an election year — to extend parking privileges to every DOE employee who owns a car and requests a permit. In addition to the 6,200 principals and other school administrators represented by the CSA, City Hall made placards available to 94,000 UFT members, along with 25,000 DOE employees who belong to DC 37. Thus de Blasio revived a broken system that encourages DOE employees to drive to work and park illegally, making congestion worse and increasing traffic hazards for students and their families. DOE employees who walk, bike, or take transit to work, meanwhile, got nothing from the deal. 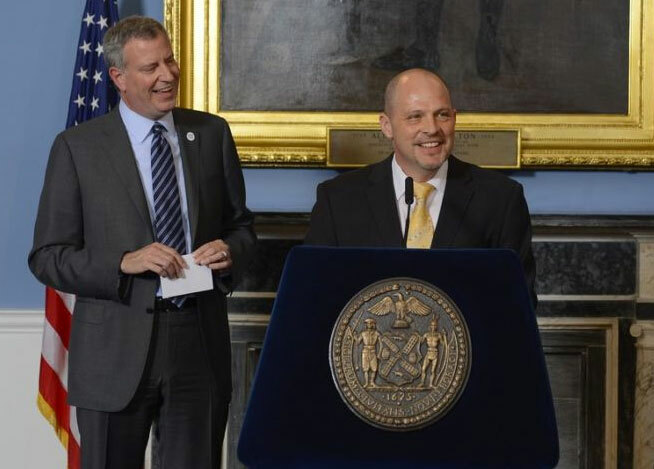 Last May, when City Hall and DOE declined to say what prompted the city to reissue permits to UFT and DC 37 members, Streetsblog filed a freedom of information request for documents related to the decision. In September, City Hall said it would release the records in late November, after the mayoral election. When City Hall told us our request would apply to some 50,000 emails, we narrowed the parameters to cover all relevant correspondence sent to and from city email accounts belonging to the mayor and certain high-level aides and department heads. The emails ultimately released by City Hall were limited to 19 pages of correspondence [PDF], all of it dated after Streetsblog broke the news of the placard deal. We received no documents that shed light on how the deal came about. Of the 19 pages we received, 10 pages were press clippings. The rest consisted of a single email thread, with de Blasio and other officials hashing out a response to the wave of coverage that followed Streetsblog’s initial story on the placard giveaway. Virtually all of the remarks by the mayor, DOE Communications Director Devora Kaye, and DOE Chief Operating Officer and Chief of Staff Ursulina Ramirez, were blacked out. Looped in on the email thread were First Deputy Mayor Anthony Shorris, de Blasio Director of Intergovernmental Affairs Emma Wolfe, Office of Labor Relations Commissioner Robert Linn, OLR First Deputy Commissioner Renee Campion, DOE Deputy Chancellor of Strategy and Policy Josh Wallack, and other de Blasio aides: Deputy Chief of Staff Rachel Lauter, Deputy Chief of Staff Kevin O’Brien, Deputy Chief of Staff Avi Fink, and Senior Advisor for Strategic Planning Andrea Hagelgans. City Hall counsel cited Public Officers Law §87(2) (b) and (g) to explain the redacted text. The law exempts disclosures that would “constitute an unwarranted invasion of personal privacy” and “inter-agency or intra-agency materials” that don’t cite statistics or factual information. Streetsblog will be challenging the redactions. Even if they are determined to be legally justified, however, that doesn’t account for the paucity of records turned over by City Hall. Administration officials named in Streetsblog’s records request — including de Blasio and Wolfe — are on the thread discussing the press response to the placard deal. It strains credulity that none of them sent or received correspondence about the deal before it was announced. Furthermore, none of the senders or recipients in the emails released by City Hall work outside of government, but emails are subject to disclosure as long as one party was named in Streetsblog’s request. If there is correspondence about the placard deal between the mayor and UFT President Michael Mulgrew, for instance, that should be included in City Hall’s response. Streetsblog is preparing additional freedom of information requests in light of City Hall’s response. Gotta love the irony of teachers endangering children walking to school. Bill de Blasio: a so-called progressive who’s as corrupt as any Republican. It’s crazy how secretive NYC officials are about everything. It’s a system that’s set up to provide transparency, which virtually anyone in any city office can decide to override based on a series of loopholes which are virtually impossible to challenge. I’ve filed probably 30 or so FOIL requests as an active journalist in NYC — mostly with the NYPD. 90 percent of them were outright denied and the rest came back looking like the photo above. It’s a total joke and there’s no recourse even if you have the money to fight it legally. Why are the Mayor, and the union, and his administration so afraid of this? Is it really that big a deal? No. But it symbolic of many, many much bigger deals that are under Omerta. It’s not a “tale of two cities,” as was claimed when DeBlasio ran. It’s a tale of tree cities, the executive/financial class, the political/union class, and the serfs. And for the most part, politics is about having the government serf the former two classes as the latter’s expense. Both Republicans and Democrats like to pretend that when they hand out special deals — whether tax cuts for the rich, or pension increases, featherbedding or lower work expectations for the unions — that the money pours out of the sky, and no one is made worse off to pay for it. It’s a lie, but as long as the costs are hidden and deferred people, though increasingly angry and frustrated, could be diverted to scapegoats. But it’s hard to hide the allocation of parking spaces. There is no way to run a parking space debt payable later. No mention about how this non-taxable benefit from the city is also, clearly, linked to the mayor’s opposition to congestion pricing? Civil servants ARE the middle class people who drive into the city over the free bridges. NYC is called Moscow on the Hudson for a reason. Those in charge haven’t gotten the message that communism fell over 25 years. Or maybe they’ve seen so many Cold War spy movies that they think everything is a top state secret. It’s pretty obvious here the Mayor made some under the table deal with the unions, perhaps something illegal or quasi-illegal. If I ran things parking around schools would be eliminated, the streets would be car-free during school hours, and any parking lots on school premises would be turned into play areas. Let the teachers get to school the same way most other people in this city get to work. If they can’t, then find another job. “I have to drive to work” is no longer acceptable nowadays if you live in a big city. They should supply reduced cost public transportation instead. Yeah, but does anyone believe it made a difference in his landslide victory? Basically he’s undoing progress made by his predecessor for no good reason other than to undo it. Reminds me of a certain chief executive of this country. Sad. Then the problem is not the placard itself, the problem is NYPD refusing to give tickets out to people with a placard. The placard only allows them to park in the school zone parking spaces, they should be getting tickets regardless of the placard if they’re parked anywhere else illegally. It doesn’t matter if the city issues a billion placards, only 11000 cars should be able to use them at any given time corresponding to the number of parking places where the placard allows you to park. In a pair of Bloomberg-era decisions, an arbitrator and a judge agreed that school administrators were entitled to free parking on the job, and said taking transit to work was a hardship for DOE employees.